SAINT AUGUSTINE – The Crisp-Ellert Art Museum and Flagler College announce “Florida East Coast: Selections from the Guidi Collection”, an exhibition of works from the Doris and William Guidi Collection. Curated by students of the Gallery Management class, the exhibition will kick off with a walkthrough on Friday, May 4 at 4 p.m. at the Crisp-Ellert Art Museum, followed by an opening reception from 5 to 8 p.m. as part of the First Friday Art Walk. The exhibition will run from May 4 to June 15. Over the years the Guidi’s have collected an impressive group of paintings, related to their interest in the Florida landscape, specifically in and around St. Augustine, Florida. The Guidi Collection includes over 100 paintings created by Florida artists, from the 19th and 20th centuries, and includes works from Ponce era, The Lost Colony and The Highwaymen artists. “Florida East Coast: Selections from the Guidi Collection” showcases a selection of works from the Guidi Collection that highlights local artist’s depictions of the Florida East Coast over the years. 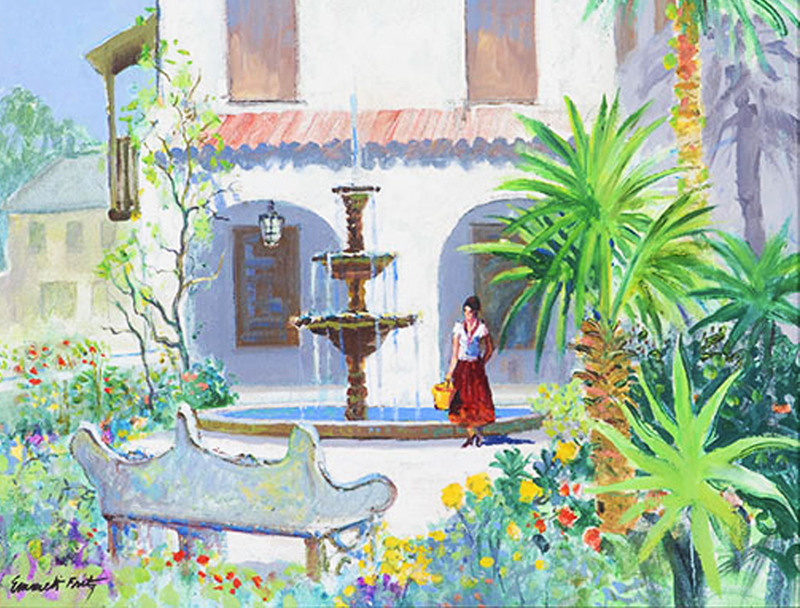 The paintings, ranging from the late 1880s until the 1970s, include idealized images of Florida’s natural landscape, along with paintings of Saint Augustine architecture that still exists today. This exhibition explores how Florida influenced these artists and their perception of Florida as an exotic paradise, despite the industrialization of the area by Flagler and the railroad. Works by these artists further demonstrate how Florida’s thriving artistic culture emerged as a result of that tourism, and changed the community’s image they perpetuated. This exhibition was curated and organized by the Gallery Management class under the guidance of Art History Professor, Dr. Chris Balaschak. Each student played an active role in contributing to the production of this exhibition. The students within the class were divided into four groups: Sarah MacDonald and Madi Hetico for marketing; Caroline Davis, Sarah Langston, Cynthia Rountree, Anadaniela Garcia, Laura Baldwin, Tyler Schroeder and Alyssa Nardi for curating; Emily Lemp and John Roberts for design; and Brandon Bates and Alyssa Wilson for educational programming. The museum’s hours during May and June are Monday through Friday, from 10 a.m. to 4 p.m. For further information on the exhibition and related programs, please visit http://www.flagler.edu/crispellert, or contact Julie Dickover at 904-826-8530 or crispellert@flagler.edu.